Echopraxia is a hard act to follow. I was extremely impressed by it, and thought about the story for several days after I finished it. 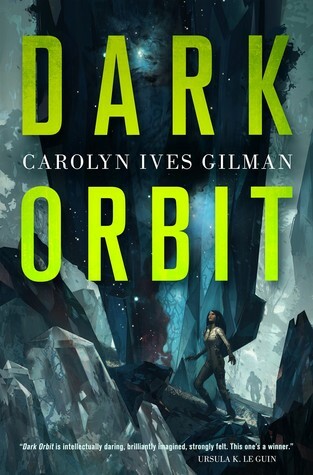 Dark Orbit features several interweaving plots, and a very alien environment that were all very intriguing. Unfortunately, it doesn't all shake out. Dark Orbit chiefly follows two women: Sara Callicot, an exoethnologist, and Thora Lassiter, a sensualist who was "corrected" after her visions led to a revolt. Thora and Sara are part of an exploratory mission to the planet Iris. Thora's an important person, akin to royalty, and Sara has been sent to secretly keep an eye on her. However, a murder on the questship they use as their base leads to suspicions on who committed it, and Thora disappears shortly after planetfall. She encounters a village of people who live in utter darkness who can somehow travel far beyond their physical means. It all goes downhill from here as Thora tries to get back to the questship, Sara tries to get back to Thora, and the crew tries to solve the mysteries of Iris. Right off the bat, there's a lot going on. The planet Iris is a mystery reminiscent of Solaris. Despite being firmly in the hard sci-fi genre, Gilman has a firm grasp on the human elements as well, such as how we perceive things is shaped by what we already know. For example, the scientists on the planetary expedition start to refer to thick areas of metallic "vegetation" as "forests" despite having absolutely no connection to any forest previously known. This idea of preconceived notions influencing exploration comes into play often as Sara and Thora individually try to come to grips with a society that operates in complete blindness. As far as the thought provoking parts of the science that goes into first contact and exploration of an alien world go, this book is top-notch. However, the many-layered plot does come across as a bit under baked and wraps up extremely fast. With so much going on between Thora's visions and her attempts to return to her colleagues, Sara's first contact work, the plot against Thora, the corporate overlords of the mission, and the strange disturbances that surround Iris and confuse the science teams, they don't all really get enough attention. Early on, we're presented with the facts about how traveling to the questship involves lightspeed transmission and physical reconstruction that takes 58 years to accomplish, and it felt like there could've been more said about how Sara and the others on the ships' lives would change by taking a trip that would see them returning 116 years after they've left without aging. I wouldn't go so far as to say that they wrap up in an unsatisfying way, but it felt like Dark Orbit is the first part of a series. There's still a lot of ground to tread here, so I hope there will be a followup. Regardless, Dark Orbit is rather good in what it does deliver: a multilayered story about exploration and first contact on an alien planet. It made me want more, and I will be disappointed if it ends here.